On November 21, the TTC Board approved the fare increase proposed by staff in their Operation Budget for 2017. Adult and Senior/Student token/ticket fares will rise by ten cents to $3.00 and $2.05 respectively. Metropasses for both fare classes will rise by $4.75 with the result that the “multiple” (the ratio between the pass price and the single token/ticket) for seniors/students drops slightly (by about 0.5) while for adults it is unchanged. 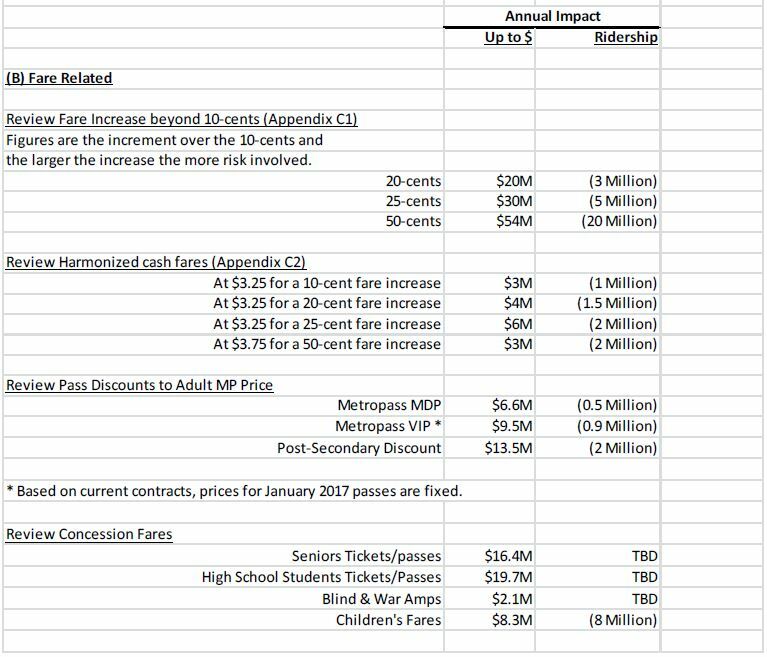 Here is the full table of old and new fares. There was a long parade of deputants at the meeting who, despite a motion by Deputy Mayor Denzil Minnan-Wong to limit presentations to three minutes, mostly managed to push the envelope out to the normal five minutes simply by taking a rather long time to “wrap up” when Chair Josh Colle gave the three minute warning. Their comments overwhelmingly spoke to the effect of a fare increase, but also to the question of service quality. Despite the TTC’s claims that they are not limiting service growth and causing crowding, actual experience does not match these claims, a point echoed by Councillors who sit on the TTC Board and who receive many complaints about this from their constituents. To soften the blow, the TTC Board voted to direct staff to prepare the 2018 budget on the basis of no fare increase so that, in effect, over a two year period fares would only have gone up five cents per year. This is a Catch-22 decision going into an election year because somehow Council will have to find the money to pay for the idea just when tax increases are regarded as political suicide, but service cuts would be equally unpalatable. The most contentious part of the debate turned on Appendix C to the report which described various options for higher fares and lower service. Included on the list was the cost of free passes for the Blind and War Amps ($2.1 million), and even considering this shows a breathtaking insensitivity. A $35.1 million shortfall in the “conventional” system’s operating budget. 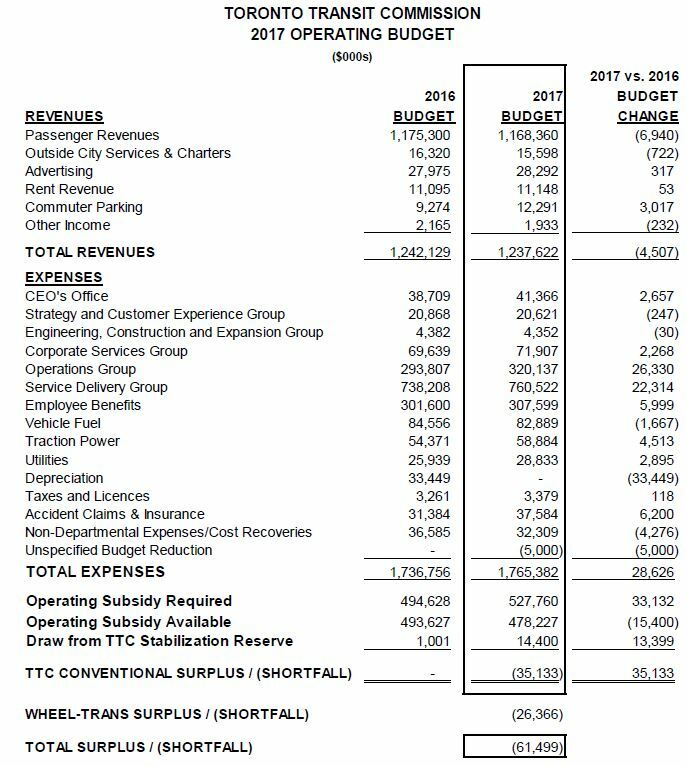 A $26.4 million shortfall in the WheelTrans operating budget. A proposed transfer of $37.5 million from the TTC’s operating budget to the City’s capital budget. This scheme has not been endorsed by the City Manager, and is simply an accounting trick to bump the TTC subsidy without showing it as part of the annual increase. Either way, it would mean increased City spending whether as “operating expense” or “capital from current”. Byford was at pains to emphasize that he would not recommend any of the changes, but produced the list because he was asked for it. What is missing, of course, is a sense of the effect of any of the changes at the individual level: how many riders benefit from which discounts, which services would be affected by changes to standards? It is easy for the budget hawks on Council to talk about “efficiencies” when they are single-line descriptions, a dollar amount, but with no specifics about what would happen. For their part, members of the TTC Board seemed unable to grasp the difference between sending an unbalanced budget to Council without recommendations on how to fix it, as opposed to taking a strong stand saying “we oppose these cuts”. This evolved as the meeting wore on with some recognition of the need to take a stand, but this did not find its way into the final motions (see below). The Board may have punted the issue over to Council, but nothing prevents Council from saying “TTC, you are only getting this much subsidy, you figure out how to deal with it”. Even a desire to save service improvements implemented at Mayor Tory’s behest will require someone to decide either on new revenues to fund transit, or on which of these improvements will die on the altar of “efficiency” and “saving taxpayer dollars”. Building a great future starts with ensuring our ability to move around. We will be recommending that the TTC commission and ultimately city council approve significant new funding for transit. Today, Chair Colle and I are announcing a $95 million investment in the TTC that is both long overdue and absolutely necessary for the social and economic well-being of our city. This investment also includes 50 new buses and a temporary storage facility that will allow us to deliver these extra services in rush hour in the coming months. During the election campaign I committed, along with all of the other candidates, not to raise transit fares in 2015. It was not until the transition period after the election that I was fully able to comprehend the scope and extent of the transit cutbacks imposed by the previous administration. Deliberate decisions were made under my predecessor to reduce service and increase crowding. So when the people of Toronto sensed service was much worse, they were right. But not only was service impacted. These cutbacks disproportionally hit those who needed transit service the most, particularly those living the suburbs. Transit connects people to jobs. It provides a means of getting around for people who can’t afford a car. To put it bluntly, we have starved our transit system to the breaking point. The effect of the Ford years (2011-2014) is clear in this table, but there has not been an annual increase of $95m during the Tory era. Although the number is commonly cited, the actual subsidies have gone up by only $55m over Mayor Tory’s two budget cycles. Meanwhile, in current dollar terms, the subsidy per rider is lower than it was at the end of David Miller’s administration. for historical accuracy, these numbers should be restated based on actual ridership and subsidy paid. For 2017 the overall budget shows where the cost increases and savings are expected. Although the fares will go up, this is a budget-to-budget comparison, and 2016 included a ridership projection that the system did not achieve. Therefore, the budgeted fare revenue in 2017 actually is less than in 2016. This is partly offset by a big jump in commuter parking of $3.0m over the $9.3m received in 2016. A new tariff for parking charges is expected at a TTC Board meeting in the near future. The CEO’s office includes functions beyond simply the senior administration of the TTC, and for 2017 will have a new group responsible for the “fitness for work” program that has already been approved by the Board. Big increases in the Operations and Service Delivery groups reflect higher base costs plus the full year effect of 2016 service improvements. Vehicle fuel costs will drop, but not as much as they might have if the TTC were not subject to the new carbon tax. Traction power costs go up because of rising Hydro rates. The depreciation item is dubious and will require a change in the City’s attitude to the funding of this item as discussed above. Buried in the Operations Group’s budget is an assumption that the cost of replacing hybrid bus batteries will be shifted to the capital budget. If the depreciation is added back in to make the figures comparable, the total expenses go from $1.737 billion in 2016 to $1.794b in 2017, an increase of 3.3%. That’s not a bad number considering the combined effect of inflation and net new costs (e.g. Presto, Spadina subway startup), but because revenues are down (relative to budget), the percentage increase in subsidy requirement is much higher at 13.4% if the depreciation figure is included. Budget-to-budget comparisons can be misleading because any erroneous assumptions of the previous year show up as a surplus or shortfall even though these may have been corrected on an actual results basis through the year. TTC management would do well to produce comparisons with “probable actual” 2016 results to show the efforts made through the year to work within changing circumstances. (*) In separate reports on the Capital Budget and the Federal Government’s Public Transit Infrastructure Fund (PTIF), the TTC proposes a very large purchase of buses, and trumpets this not simply as replacements for the existing fleet, but for the ability to provide more service to riders. More service means more operating dollars and, inevitably, more subsidy. There is a direct contradiction between the TTC’s capital plans and spending constraints from Mayor Tory and his Council allies for day-to-day operations. I will deal with the Capital Budget and PTIF in a separate article. No fare increase for 2018.
a breakdown of the hours of service per month by mode for the past two years (for the next Board meeting) to show how the actual amount of service provided on the street has changed. In the event the City does not accept the transfer of costs from the operating to the capital budget, TTC management would work with the City Manager on a five-year transition plan for these costs with a report to follow by mid 2017. A technical amendment directs and authorizes TTC staff to work with and provide information to City staff in their budget preparation. 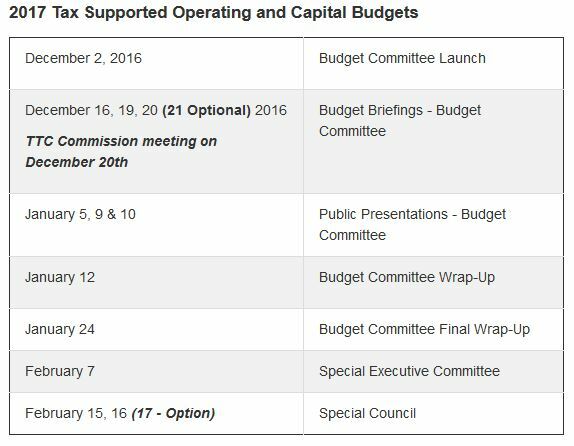 The TTC Budget Committee will begin meeting in June 2017 to review the 2018 budget in its preliminary stages. This is ironic considering that three committee meetings in 2016 were cancelled. More generally, the TTC Board seems unwilling to devote the time to policy discussions until a decision forces itself on them, but by then time for abstract consideration of options has passed. Although Board members/councillors Glenn De Baeremaeker and Shelley Carroll talked of amendments to explicitly reject the fare and service options in Appendix C, or to simply remove that Appendix from the report sent to Council, no motion to this effect was placed. John Campbell proposed that staff report on a long list of options for restructuring fares, but this was rejected as coming far too late in the process to permit a January 2017 implementation of the new tariff. Joe Mihevc sought to defer any fare increase until after the City has set its 2017 budget. Joe Mihevc sought to launch a publicity campaign to encourage Queen’s Park to increase transit subsidies, while Vince Crisanti simply wanted to ask that they fund the $61m shortfall. Shelley Carroll noted that such a request would directly contradict Council’s recent agreement to fund all costs for the new LRT lines and SmartTrack stations. Vince Crisanti proposed that the VIP program be examined as a model for a low income fare program. VIP is a bulk purchase plan and not entirely appropriate for this function. Crisanti also proposed that seniors’ fares be frozen for 2017. The next step in this process will be the City’s Budget Launch on December 2 followed by detailed discussions leading eventually to a Council vote in mid-February. Jon Johnson said: It is likely that concepts such as an electric driverless multi-seat taxi will become more viable as technology develops. A fundamental paradigm shift could occur sooner than many of us currently think. Winterized driverless cars are much further away than many of us currently think. The Tesla P100D has the top battery range currently (485km) and ‘super’ charging stations take 20 minutes to charge to 50% and 75 minutes to charge to 100%. There is already ‘UBERpool’ for a ‘multi-seat taxi’ if you mean for shared routes. Fuel cost savings would be around $20 ‘per tank’ (40L of gas is around $36-38 now, electricity $0.132/kWh midpeak, $0.18/kWh peak), but losing 2-5 fares (in the 37 extra minutes for two half charges vs. one tank of gas). UBER drivers already make less than minimum wage, and expenses are somewhere between 20-35% of revenue, so at best you might see a shift in short-haul trips away from public transit. I’m a big believer in future tech (I remember clearly a 1991 article about the “information super-highway” and “palm-top” computers, which is our current reality). We’ll see a shift, but I don’t think it’ll be fundamentally different than anything we have now. It’ll be 4-5 years before autonomous vehicles are on the market and probably 4-5 years more before they are a significant portion of the overall mix. The one thing that might change it all is a significant breakthrough in battery density technology. Generally speaking as a rule of thumb, new car manufacturing generates 1kg of CO2e per C$1 price. That’s around 1-3 years of emissions from typical driving. Thus, you’ll still have a net positive effect. If this were to be actual policy, I’d assume an EA would be undertaken to determine the best price point to maximize the impact. KevinH said: And while Ontario’s electricity generation is mostly from low- or no-GHG sources (hydro and nuclear), we still get a respectable chunk – about a sixth – from gas and other fossil fuel sources. Natural gas is generally used as a peak-supplement source. Charging overnight should be emission free (it might even bring down overall emissions by our turning on more nuclear base-power). KevinH said: Let’s play devil’s advocate for a moment. Instead of an $8000 giveaway for each electric car, what if we imposed an $800 tax on every new non-electric sale? They aren’t mutually exclusive ideas. The disincentive isn’t very impactful ($800 on 6-year bi-weekly financing is $5.12 per payment). My premise was to shift the price balance between electric and carbon vehicles. Where exactly this lays in relation to electric and carbon public transit is another debate. KevinH said: It doesn’t massively and disproportionately subsidize households that are already wealthy enough to purchase one or more new cars; it compensates society to an extent for the external costs shrugged off by car owners. By all means, add a means-test to any program. The question is if there is a net benefit to society. Benny Cheung said: Driverless EVs are coming down in price. Imagine a world without auto accidents, auto insurance would cost a few hundred dollars per year at most. I’d wait for them to be on the market before saying they are coming down in price. Up to now it’s all development costs. Even in an EV world, there will still be auto accidents (even if just caused by the remaining human drivers). There are some unavoidable conditions where injury or death would still occur. Benny Cheung said: Why do we care what the TTC does as long as transit is comfortable, fast, efficient and on time? That’s the primary fallacy there. Imagine a world where your oil refinery needs a major upgrade, so the TTC goes on to spend $1B on their financial investments while saying there isn’t money for new HVAC for Line 2 trains. Imagine if the TTC says, fares will be rising by $0.05 because of an unexpected downturn in oil refining margins. Benny Cheung said: The underlying problem is that the TTC do not invest enough on the capital side. The problem underlying your underlying problem is that Toronto doesn’t invest enough in the TTC. Benny Cheung said: We cannot have a world class transportation system if we do not stay at the forefront of technology. Ketcham and Komanoff, $4,220; “Subsidies for Traffic”, March 1994 – $2,400M (1991) or $2,018M (1992). There were 10.56M New York drivers in 1992, so that’s $192.85 subsidy each. Littman, $1037-4,631; Was this Todd Litman from VTPI? If so that’s the “Cost of Transporting People in the British Columbia Lower Mainland” 1993 study, which I initially spoke about. Mackenzie, Dower and Chen, $2,312; The Going Rate, June 1992 – this is a fundamentally flawed study that takes one regional number then assumes it’s applicable nationally. However, they conclude $300.5B a year for 190M cars or $1,581 per vehicle. Moffet and Miller, $1,370-$2,739; “The Price of Mobility: Uncovering the Hidden Costs of Transportation”, October 1993 – A subsidy cost of $0.38 to $0.53 per passenger mile for private cars, $0.35 to $0.40 for buses, and $0.48 to $0.52 for rail. With an average of 11.6K miles per vehicle, that’s $4,426.56 to $6,173.89 per vehicle, but on par for public transit subsidies. Vorhees, $3,647; Voorhees, right? “The True Costs of the Automobile to Society”, January 1992 – this primary source is hard to find. The site where it was publically available is no longer active. However, one of his major price contributors was the “Persian Gulf Wars”. However, in the past 25 years, the US has realised their dream of becoming geopolitically free from middle-east oil (excluding Saudi Arabia, they only import 5% overall from the Persian Gulf vs over 50% in 1991). Steve: Hamish did say that he had a chart with this info, and so the typos are presumably on the chart. Your time frame is likely reasonable. I would posit that you have it backwards, the short-haul trips should be moving TOWARDS higher order public transit in a way that solves the “last mile” problem, making public transit much more attractive. Welcome to the club. 🙂 Though, my amusement came from checking it online. It did amaze me that there were free rides because the daily cap had been reached for the zones involved and other free rides because the trip was considered an extension of a previous trip. I will add to Mapleson’s comment that overnight charging may even bring down overall emissions by saying that even if all charging were done at peak when additional natural gas produced electricity is increased, overall emission will go down. Why? Because of the increase in efficiency of production. If all internal engines burned natural gas, there would be X amount of emissions produced. (Forget for a moment of comparing emissions from burning gasoline over natural gas, I want to compare apples to apples here). If all those vehicles were replaced by electric vehicles and ALL their charging was done using electricity produced by burning natural gas, there would be an overall decrease in emissions. This is due to the fact that an internal combustion engine (using the Otto method that gasoline/propane/natural gas are burned, as opposed to the Diesel method) cannot get more than about 30-35% efficiency from the burning of fuel, and since it has to operate over a range of load/speed values, tends to be even less. Burn the same fuel in a controlled environment that is possible with a stationary plant, and the efficiency can be much higher. Thus, much less emissions for the same ton-kilometres of vehicle movement. Use some or most of the lost heat from such a plant to heat nearby buildings, and emissions go down even further. Burning of any fuel under ideal load conditions will always be easier to achieve better efficiency than burning it under varying load conditions. The latter is necessary on board a moving vehicle. CALVIN H-C: Absolute efficiency percentages are not cast in stone. I’m not advocating for the gasoline fueled internal combustion engine, but the fact is that, in its present form it is achieving efficiencies that we could only dream of 40 years ago. Of course, I drive a Mazda, the rest of you may not be so lucky. 2) They changed the age for free children’s fares to 11 and under. Why? Because that’s when they move from Junior School (Grade 5) to Middle School (Grade 6). Steve: A breakdown of the TTC’s rides by type can be found on the City’s Open Data website. In this spreadsheet, you will see that of the total rides in 2015 (534m), there were about 71m seniors/students. Note that some of them used passes (25m) and so their average fare would be lower than the standard ticket or cash rate. Let’s say that the average fare paid per ride was about $1.50. That means they collectively paid $106.5 million (71m * $1.50). If we raise their fare from a 1/3 discount to a 1/4 discount, this translates to an average fare of $1.69 or total revenue of about $120 million for an increase of $13.5m presuming no losses from negative elasticity. Twelve years was a convenient number for Tory’s announcement. I suspect the politics of the situation is that letting “teenagers” ride free wouldn’t wash. There are cross-subsidies every which way in transit and many other areas for a variety of purposes, some social, some economic, some political. It depends on the area. In Scarborough, at least, “Jr. Public” school is K-6, and “Sr. Public” is 7-8. There are also a few “Public” schools that are K-8. Atkinson cycle will have better efficiencies than the Otto cycle at the expense of power. Hybrids with their torque rich electric motors can mask the lack of power. The Hyundai Elantra runs on an Atkinson cycle all the time. Infinity has developed a variable compression ratio where the engine can change the compression ratios. For example, at idle, it will run at 11:1 for fuel efficiencies. When the driver wants to have some fun, it will lower the ratio to 8:1 and boost the engine with a turbocharger. There is still a lot of development with the internal combustion engine. There are no issues with the power grid with increased EV usage as long as Darlington is expanded. 4 CANDU 6 reactors can produce over 3500 MWe worth of pollution free electricity. As long as there is a water source, running 12 reactors on the same site is possible. Uranium prices have been stable for the last few years and it is domestically sourced. The TTC should be at the forefront of technology. Where will Amazon be without technology? This is why they are researching drone deliveries. As much as Amazon can squeeze the likes of UPS and FedEx. These services cost money since drivers and fuel need to be paid. With drones, the cost are much lower and stable. Drone deliveries can be more direct. See that TV you like, the drone will delivery it to your house before you even get back home. No need to wait for the courier and no need to haul it back in a SUV. At some point, it will be possible to purchase groceries online and have it delivered without even stepping outside of the house. Yes, being at the forefront of technology carries risk. However, the TTC must continually innovate so that it can deliver its service better and cheaper. Using the example of the hybrid bus, it is something that should have been done a long time ago. Next generation hybrid bus will have electric motors on the front wheels. This allows for all wheel drive. This way, the 95 bus can get up the hill in the winter. This is a plus for the TTC and customers. Quicker acceleration also means shorter block times. Customers are also treated better since the noise of the diesel engines can be more muted. Maintenance cost will be lower as regenerative brakes do not rely on friction to stop the bus. Finally, the fuel savings along with tax credits will ensure a lower lifetime cost of operating that bus. Savings derived should be used for more innovation. For customers, stable prices and improving service will win the hearts. Right now, the TTC is raising prices and service will probably be the same. Look at the example of Delta Airlines. Their CASM for their JFK-CDG route is already 10% lower than their competitors due to the ownership of the Trainer oil refinery. When they decide to opt for the Boeing 777X, the CASM will go down another 10%. This means that given the same Y ticket price, they are able to provide an extra flight attendant, better catering (food on board) and still have a cheaper price than United and American. We should embrace technology to solve problems as oppose to raising fare prices. Kevin Reidy said: 2) They changed the age for free children’s fares to 11 and under. Why? Because that’s when they move from Junior School (Grade 5) to Middle School (Grade 6). In Toronto there are 3 JK-4 schools, 97 JK-5 schools, 149 JK-6 schools, 2 JK-7 schools, 143 JK-8 schools, 2 SK-6 schools, 3 SK-8 schools, 1 1-5 school, 6 4-8 schools, 3 5-8 schools, 30 6-8 schools, and 31 7-8 schools. It’s not really a clear line, but more kids switch at grade 6 than 5. If you want to change the definition of “children’s fares” I prefer the old-school method of height: free under 54.5” (1.38m). Just add a sign like on rollercoasters “if you are under this tall, you ride for FREE!” Maybe this will cause more slouching. Benny Cheung said: 4 CANDU 6 reactors can produce over 3500 MWe worth of pollution free electricity. Depending on your definition of pollution. They definitely are CO2e/GHG free. Benny Cheung said: Uranium prices have been stable for the last few years and it is domestically sourced. Uranium prices were stable from 1988 to 2004 around $18/lb. but spiked to $136/lb in June 2008, down to $42/lb in Mar 2009, up to $72/lb in Jan 2011 and have been trending down this year ($34.70, $32.15, $28.70, $27.50, $27.25, $26.70, $25.45, $25.25, $23.00, $18.75 monthly spot prices in 2016). That’s not my definition of “stable”. Benny Cheung said: Where will Amazon be without technology? Benny Cheung said: Yes, being at the forefront of technology carries risk. However, the TTC must continually innovate so that it can deliver its service better and cheaper. Using the example of the hybrid bus, it is something that should have been done a long time ago. I am not saying for the TTC not to modernize, but they do call it the bleeding edge of technology for a reason. Hybrid buses are the perfect example of the TTC being a front runner and getting burned when the technology didn’t live up to the hype. When “next generation hybrid buses” become “this generation hybrid buses” is when Toronto should be buying. Let someone else pay to figure out all the bugs. Benny Cheung said: Savings derived should be used for more innovation. We should embrace technology to solve problems as oppose to raising fare prices. This is two-fold. First, we have the mentality to automatically use any savings to avoid raising fares and the City subsidy. Second, there is an investment hump where embracing technology raises costs (both capital and operating (for example training)), which would compound our current issue of raising both the subsidy and fares without also improving service. The TTC’s use of outdated technology means it kept streetcars longer then other cities which was a factor in keeping Toronto’s downtown active and vital during the 1970s and 80s. The TTC’s use of outdated fare collections technology means it will only have to pay for 2 terrible electronic fare systems rather then 3 or 4 other systems go through. I am not an expert on GHG and have to rely on reports from others. Unfortunately, some advocates support their positions with facts that are not totally accurate. Therefore I do not know if the assertion that the mining and refining of uranium creates GHG at a level equivalent to natural gas generation of electricity is 100% true. However, there can be no doubt that these processes have at least some GHG and pollution impact. Therefore it is not true that nuclear is GHG free. In addition, the accumulating waste is scary. If the Romans had nuclear plants, the most volatile of the waste would be 20% of the way to safe today. Perhaps society, through the dark ages and the middle ages, would have been more adept at keeping the waste pools maintained than it was for the Coliseum. If not the “pollution free” nuclear power would have claimed many lives over the ages. Energy use pollutes and creates GHG. Even windmills and solar panels require considerable pollution and GHG input in their manufacture. New Hydro – where the water is not falling over natural falls – causes methane GHGs and can result in mercury pollution in the water. Replacing mass transit with individual electric cars would be a negative move for our future. It would increase pollution and GHG and has been noted elsewhere in this comment chain, would cause dysfunctional congestion. Except the insufficient number of transformers throughout the city to distribute power with the existing ones having a tendency to detonate due to age and overuse. Driverless EVs will not solve all the problems in the world. However, we must be aware of what it can do and prepare transit to meet this competition. If it is technologically and economically feasible, it will be a competitor to transit. I will give one example. The Air Canada training center in Toronto is located at 3111 Corvair Dr. Some of the classes ends at midnight. The 112C bus and the Mississauga Transit Number 7 bus will probably not show up when training ends. It will be around a 20 minute wait. Driverless EVs, non automated EVs, Uber, taxi and transit are competing for that trip. I am not going to speculate what people will choose, but people makes these type of decision all the time. Not knowing your competition is detrimental to your business. When Boeing did a clean sheet of the 707 program, it almost killed Lockheed. Lockheed bet the farm that jet engine introduction would be slow and gradual. They believed that the piston engine (propeller) would still be around. They even developed a hybrid jet propeller system. Once the 707 was launched, the world never looked back and embraced the jet. The Constellation, no matter how fine of an aircraft was relegated to feeder routes. Even the next gen Starliner did not sell well. Lockheed did not have a bestseller until the Tristar. Raising fares in this type of environment is not smart. While it will not affect the ridership on Line 1 as it is still faster than automobiles. However, what will happen to the marginal routes like 169 and 130 where the bus do not come often. While routes like 169 do not carry a lot of passengers, having them is important so that the network is complete. If the network is not complete, it makes automobiles more attractive. This is the issue that I have. I am not advocating for driverless EVs. If one looks at the all the upcoming technologies and competition for the TTC, one would question the wisdom of raising price without improvements in the hard and soft product. Intergovernmental Panel on Climate Change made a report on the total lifecycle greenhouse gas emission on various energy forms. Fission based energy (like Uranium and Plutonium) emits less greenhouse gas than even natural gas. Spent fuel rods can be recycled at some point. A sodium cooled fast breeder reactor (like Monju) can make electricity out of spent fuel rods. Nuclear fission is not all that efficient so that even spent fuel rods still contains energy. If we have no reactors, how will we make radioisotopes for medical use? Years ago, I checked the breakeven point on the Metropass for rides. When I became eligible for the Senior Metropass, I did not recheck the ratio. However, when TTC announced the new rates, I decided to check out the senior rates and was amazed to find how poor an option the Senior Metropass is. The breakeven point in rides varies greatly. It would appear from this that the TTC thinks that Seniors (most of whom do not commute to work) will be taking at least 8-10 more trips than the commuters. 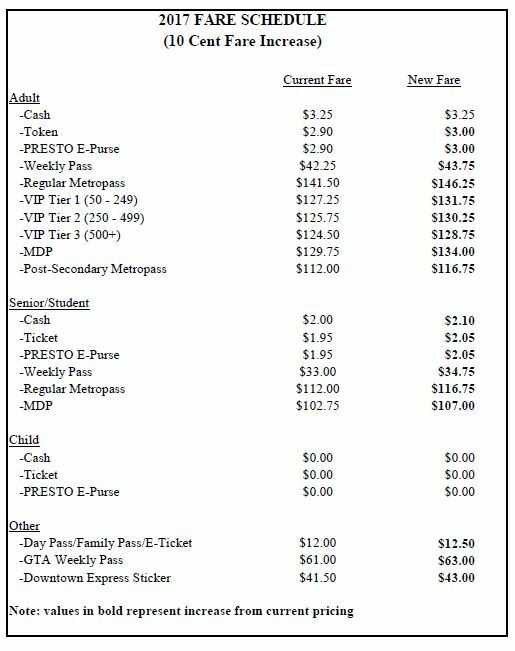 To bring the Senior Metropass into line with the regular one (by number of rides), it should be priced at $94.50 (vs cash) or $99.95 (vs ticket). If as Kevin Reidy suggested, the TTC raised the Senior ticket price to $2.25, the Metropass / ticket breakeven would be 51.89 rides, still higher than the standard Metropass/token, and lowering the Senior Metropass price to $109.70 would match the breakeven point of the standard pass. However, a case could be made that the Senior pass should require fewer rides to break even rather than just matching. Michael Greason said: I do not know if the assertion that the mining and refining of uranium creates GHG at a level equivalent to natural gas generation of electricity is 100% true. I would put this one under total cow paddies, especially for Canadian uranium. This Abstractsuggests that the GHG is at 1.1g CO2e/kWh compared to 553.3g CO2e/kWh for natural gas. Michael Greason said: If the Romans had nuclear plants, the most volatile of the waste would be 20% of the way to safe today. Michael Greason said: Perhaps society, through the dark ages and the middle ages, would have been more adept at keeping the waste pools maintained than it was for the Coliseum. If not the “pollution free” nuclear power would have claimed many lives over the ages. Or the “pollution free” nuclear power would have prevented the dark ages, black death, and crusades saving millions of lives over the ages. You could take the supposition one step further and say we’d have a united world government under the Holy Roman Empire because I’m sure some clever Roman would have found a way to weaponize electricity. Michael Greason said: Energy use pollutes and creates GHG. We often lose sight of the forest for the trees when talking about GHG emissions. The 2°C target comes with a roughly 275Pg-C usage limit (depending on how you view atmospheric residency). At 1.1g CO2e every person in the world could use 100 kWh per month for 28.5 years (ignoring population growth) or 62kWh per month indefinitely (assuming a 40-year residency window and peak population around 10B). Benny Cheung said: The Air Canada training center in Toronto is located at 3111 Corvair Dr. Some of the classes ends at midnight. The 112C bus and the Mississauga Transit Number 7 bus will probably not show up when training ends. It will be around a 20 minute wait. And the UPX, Crosstown East LRT, and expanding MiWay 5 service? Midnight service isn’t a core area of transit. Benny Cheung said: Raising fares in this type of environment is not smart. If the network is not complete, it makes automobiles more attractive. This is the issue that I have. We aren’t in an environment with driverless cars (EV or not) nor uber/taxis being price competitive. Generally, we are paying for the level of convenience (transit less on both, private cars in the middle, and uber/taxis at the top). Driverless cars are going to be more expensive than normal cars ($5-10K I’d guess). It’s more likely that driverless Uber will be price competitive to private car ownership and a tax will be slapped on it to underwrite marginal transit routes. Benny Cheung said: If one looks at the all the upcoming technologies and competition for the TTC, one would question the wisdom of raising price without improvements in the hard and soft product. First, we are improving transit. Second, the operating budget issue is one of rising costs, so it’s either higher prices/tax subsidy or less service. You can improve service beyond that, but it’ll cost more again meaning even higher prices and subsidies. The airline market isn’t comparable because there are ~22M cars in Canada and ~2.1M sold every year. Most people have 4-7 year lease/financing. Airlines can write off old planes and make money using much more efficient jet engines. People aren’t going to be saving enough money that they’ll give up that $20K debt to buy a new $50K car. Benny: As usual, you made an interesting set of points, and there is no question that the 707 changed the face of transportation. Lockheed ‘bet the farm’ on the turboprop because it was a more efficient engine design than the turbojet, not because they didn’t keep an eye on what Boeing was up to. The latter won that battle for two reasons. First they won the air force contract for the jet refueler that was a 707 forerunner, which allowed Boeing to use the air force to underwrite their development costs. Second, the public of 1958 was entranced with ‘jet travel’ no matter how expensive. Turboprops looked old fashioned and the fifties was the wrong era for old fashioned. The TriStar was an excellent airplane, but, along with the C5, it almost bankrupted Lockheed. The competing, and dangerously inferior DC10 took away considerable market share for reasons that defy rational belief to this day. Of course, all this caused the decline of the long haul intercity passenger train in Canada and the USA. There are several ironic parallels to the [now somewhat arrested] decline of urban and suburban electric traction as well. While I’m sure Steve is getting a concussion from the facepalming that’s resulting from this diversion, I just want to point out that the volatility of radioactive isotopes is inverse to their decay rate. So the most volatile waste has the shortest half life. It’s the less volatile radioactive waste that’s the problem since it has time to enter the food chain and accumulate in plants, animals, and people. That said, to put things into perspective, the Chernobyl Exclusion Zone and all areas affected by the Chernobyl disaster will be as safe as areas completely unaffected by the disaster in about 300 years. The exception being the area around and including the Power plant itself due to the higher concentrations of uranium and plutonium. I am reluctant to continue this discussion, but I do feel that I have been maligned and need to respond. The connection to the thread is that there was an assertion that electric powered self driving individual vehicles would be non-polluting and an effective alternative to mass transit. The purpose of my post is to refute this. No concussions – or face plants – need be involved in my dedication to this belief. All the attacks fall short of assurance in my view. I have reviewed nuclear waste on the internet and understand that the most volatile has the shortest half life. I also know that being unfortunate enough to live over a natural radon emitting site significantly increases lung cancer rates. I can’t begin to imagine what being exposed to one quarter of annual background radiation in an hour could do to a person who is exposed for a year or years. This is a future dystopia to be avoided. Furthermore, if some of these decayed killers enter a water table – or worse our Great Lakes – at some time in the future – or now – the moderate radiation poisoning will be ongoing for a long time. I could go to Grassy Narrows today and stay for a week. I could drink the water and it would not affect my health – for a week’s exposure. Living there is something different. Plutonium is a small portion of our nuclear waste. However, I stand corrected in saying that if the Romans had had Plutonium it would be 20% of the way towards being safe today. I read various estimates of the half life, but millions of years is not uncommon in the wording. Five hundred years is also a very long time. Henry VIII was King of England 500 years ago. Do we want a world where Henry VII kept something safe enough that we can live beside it for an hour today. The fact is that “non polluting” nuclear power leaves a very long trail of deadly pollution. We can encase our waste in ceramics and put it in salt mines or pre-cambian rock. We can store it in “pools” on the surface for a short time. A very short time. We cannot ensure that our descendants will not suffer from these deadly pollutants. What if they mine for salt. Finally, I might point out that industry websites are not actually that authoritative. If I cited Greenpeace, much would be made about that. However, Greenpeace’s “tame” scientists are no more or less “tame” than the industry experts cited by others on this site. I was unable to find much information on the internet that was not from “industry experts” and that included the links used to refute my initial concerns. Then you better stop using Toronto’s water since uranium is a natural trace element in it. Steve: I believe the distinctions here are (a) which isotope, (b) its level of radioactivity, and (c) its half-life. Not all uranium atoms are created equal. One should not forget that the decline or interurban passenger rail was not caused simply by the availability airplanes and automobiles, but also, in the USA, by huge federal spending splurge on the interstate highway system (originally justified as needed for defense purposes) and the state and local spending that followed on highways and freeways, and also by the large amounts of federal, state, and local subsidies given out to construct and expand airports – a lot of which was driven by industry lobbying. Lobbying that a lot of people were receptive to because the railway tycoon “robber barons” of the past had left a rather bad impression collectively from their time of running a monopoly business essentially. So it’s rarely just technological change, often the political/social changes are crucial. There are lots of excellent potentially breakthrough technologies which failed due to regulatory strangling, and subpar ones which flourished due to regulatory support. Michael Greason said: I am reluctant to continue this discussion, but I do feel that I have been maligned and need to respond. The connection to the thread is that there was an assertion that electric powered self driving individual vehicles would be non-polluting and an effective alternative to mass transit. I refuted electric vehicles as “pollution free” as well as nuclear power. However, you’ve taken the argument too far. Nuclear waste is a major issue. Supposition and egregiously errant claims become distractions to the issue. I hope mining radioactive salt is the worst case scenario for 500 years hence. Henry VIII was known as a well-educated and accomplished king, as well as an author, composer, and musician. His reign was defined by his desire to preserve English peace via a legitimate male heir. I’d be happy with his guardianship of our collective wellbeing. Radioactive exposure decreases by the square of distance, so a year at 9 feet from unprotected waste, it’s the same as the maximum exposure limit per year as nuclear workers; 50 years at 28 feet would increase lifetime risk of cancer by 0.4%. Michael Greason said: Finally, I might point out that industry websites are not actually that authoritative. Who exactly are your authorities, if you reject Crown corporations and international safety regulators? People who work in the nuclear power industry have the highest incentive for considered and stable use and disposal. Decay rates are routinely published by independent regulators, empirical researchers, and industry participants. Rather than trusting one source or another, try looking at the overall evidence and details provided and draw your own conclusions. To bring it back to transit, it’s this tendency for the rejection of contrary data that allows white elephant projects to waste our capital budgets. Steve: A note to all: Can we please end this discussion of nuclear power as it really is taking the thread off topic. I think everyone’s position is clear by now. The 112C bus and the Mississauga Transit Number 7 bus will probably not show up [around midnight]. It will be around a 20 minute wait. Driverless EVs, non automated EVs, Uber, taxi and transit are competing for that trip. I am not going to speculate what people will choose. I will. Your occasional traveler _might_ choose a taxi-like option. A commuter? Absolutely not. First of all, nothing is close around there so if you take a cab its gonna cost you. If you can afford to take a cab home even a couple of nights a week, you probably aren’t working around there. Uber? No Uber user I know would describe the service with the words “it is cheaper than a taxi” without adding a lengthy conditional which will be easily failed by whatever route you had in mind, so scratch that from the list too. The hour you described is indeed a low point for transit usage in that corner of the map. At the plant I worked at near the Airport I was one of a handful of non-drivers on the shift which let out at 11PM. The exact size depended on whether some people’s lifts (I hesitate to call it carpooling…) did or didn’t come through. The other shifts had a higher proportion of transit users which might be due to better service available during the day (I will save my gushing about Mississauga Transit’s good connections at Islington for reverse commuters but know that they are good! ), but also on those shifts there was a high proportion of 1-way lifts. I.e. wife, friend, parent drops you off in the morning but can’t pick you up because they work across town on a different schedule. This made the afternoon buses packed some weeks when a lot of shifts were out of sync and empty on other weeks when more people could give each other lifts. A month’s worth of GTA weekly passes is now $244. You could even go cheaper if you bought the bare minimum of Mississauga fares and tokens. How many cab rides can you buy with that? And if you have a car or a lift (who’s not on you too hard about gas!!) I doubt you are even considering anything else. ANDRE S: Yes, of course there was a multi causation scenario in the case of the decline in long term passenger train travel. You’ve reminded me of the early days of travel on the Interstate system. It all stretched out like a perfectly engineered ribbon that would take you to your destination anywhere in the USA in a matter of 2-3 days, with no jam ups. Today, things have changed, as they always do with roads of any kind. As transit advocates have proclaimed for many decades: Build a road and they will come; in droves. The politicians of north-central York Region currently find this difficult to understand, but, to their credit, they have pretty much stopped building new roads, and seem to be concentrating on new subdivisions. I have no idea how these newcomers are supposed to get to work. No one finds their perfect house across the street from their perfect job. GO does an admirable job, but it can’t go everywhere and their funding is under threat from Smartrack and the next election result in Ontario. To borrow from Steve: most of our politicians are punting their transit responsibilities into the future, to a point where solutions will be impossible to find.